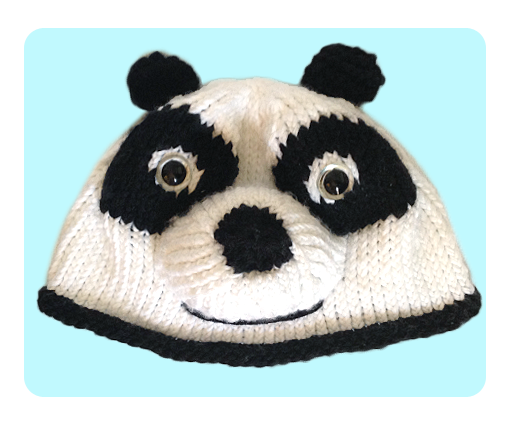 Free Kungfu Panda Inspired Hat Knitting Pattern, with Video Tutorials! 14 sts + 19 rows = 4″ (10cm) in Stockinette stitch. So, my 3yr old son recent obsession is with Kungfu Panda. He loves watching the Disney movie on repeat and relate everything to Panda — such as, panda toilet, panda car, panda chicken (I don’t know why he started talking panda language, though I must admit it’s kinda cute!). Now, knitting a hat took me ages! I select super bulky yarns to make the hat since I thought bigger yarn and needles means faster to finish. Well, that is true though I kinda regret it a little now because I just found out that I don’t like the look of finished knitted bulky yarn as much as fine one. I am planning to make 2 hats, one for me and another for him (and you can bet that the next hat will use smaller yarn and needles ;)). 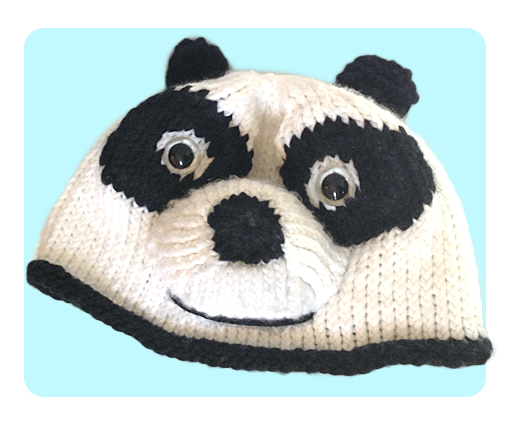 I have knitted the hat separately from the other elements and later using duplicate stitch method to add the eyes. 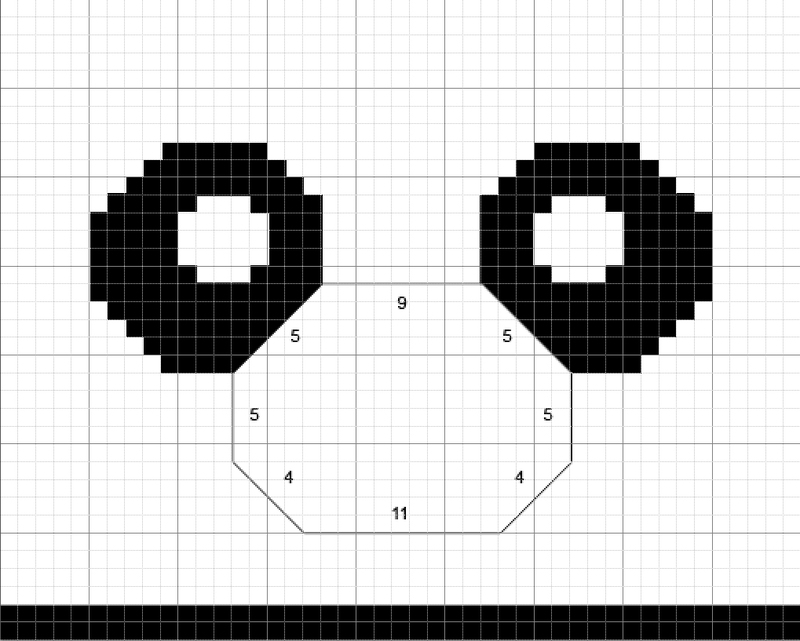 If you prefer, you can use the chart below to knit them together. 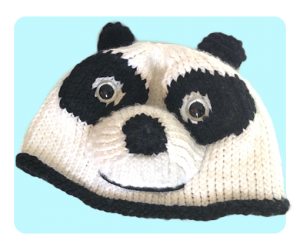 I personally haven’t tried Intarsia / Fair Isle / Duplicate stitch when I was designing this hat, and after reading many references, I decided that duplicate stitching will be the easiest to do out of the 3. Plus, it gives a slightly raised look to the finished work which will look great for eyes. If you need any help, I have also included video tutorials in great details showing each knitting progression. With Black and circular needles / DPN, Co 72 (78, 84, 90) sts. Being careful not to twist. Cut yarn, and thread through each loop with tapestry needle. Pull tight and secure. Cut White yarn, seam ends together before proceeding further. Cut yarn, thread through each loop with tapestry needle, pull tight and secure. With Black and tapestry needle, duplicate stitches as per chart provided. Cut yarn, thread through all remaining loops with tapestry needle, pull a little so the ear curves. Thread it downwards and attach it to the top of the hat. Ok, I planned to include all the videos in a single post, but guess what.. They are massive!! I’ve been editing the videos for almost a week now and I still couldn’t finish it 🙁 So I will post the videos later on. 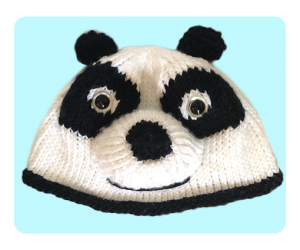 The videos includes detailed steps for knitting the panda hat. I am planning to divide them into parts so I won’t go crazy waiting for the video encoding time, plus it will be easier to check out the videos only on the parts you want to see later on. Will link the videos directly above this paragraph when they are ready! 4/11/12 — Part 2 uploaded. 10/11/12 — Part 3 uploaded. 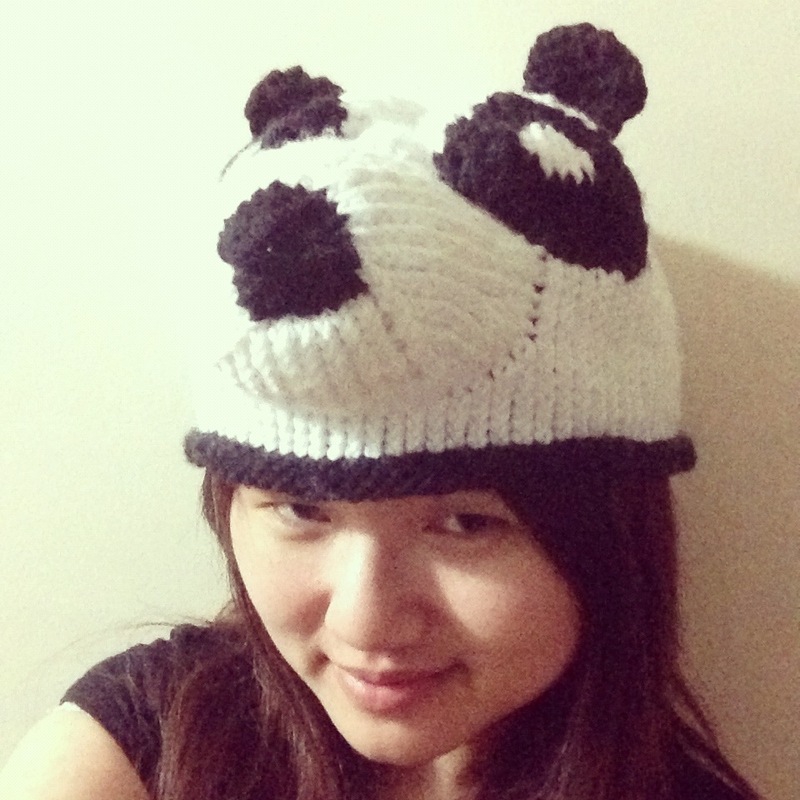 This must be my longest post to date, I just hope it helps anyone who tries to knit the kungfu panda inspired hat. If you need any help, just ask and I’ll try my best 🙂 Good luck & Happy knitting! (DPN) double pointed needles, circular needles, free knitting patterns, intermediate knitting patterns, knitted hat. Bookmark.